In Amagi Brilliant Park, the mascot of the titular theme park is a mascot named Moffle. 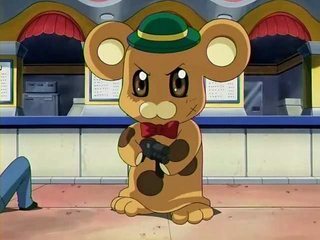 For anyone who knows Full Metal Panic!, this no doubt bears a strong resemblance to Bonta-kun, the suit that Sosuke designed. Of course, they don't look exactly the same, but they're similar enough that this is definitely not a coincidence, and viewers are expected to catch this reference. I know that both Fumoffu and Amagi are animated by Kyoani, based on light novels written by Gatoh Shoji, and directed by Takemoto Yasuhiro. That's already enough to establish a connection between these series, so that this sort of reference isn't out of place. Is there any in-universe connection between these two series, or is the reference just a throwback to remind viewers of the earlier work and the staff connection between the two? It seems that the author liked Bonta-kun's design so much, so he reused (with Shiki Douji's appoval) it in this series. As for the secondary main character "Mofuru", I ended up borrowing Bonta-kun of FMP. I just couldn't separate the two characters in my head, so I had the idea of just using Bonta-kun directly. I thank Shiki Douji for giving his approval. I think because Shinji Gatoh is the original creator of both of them? The character of both series is the same if you compare each other. A character that shoots guns easily. And the delinquents who beat in front of an amusement park. Well, Bonta-kun was first stolen by Sosuke at an amusement park and was remodeled by him. Now, it cannot hurt to say that it came from the same place. Maybe this is a prequel of "The Birth of Bonta-kun"? Just a thought. Not the answer you're looking for? Browse other questions tagged full-metal-panic amagi-brilliant-park or ask your own question.